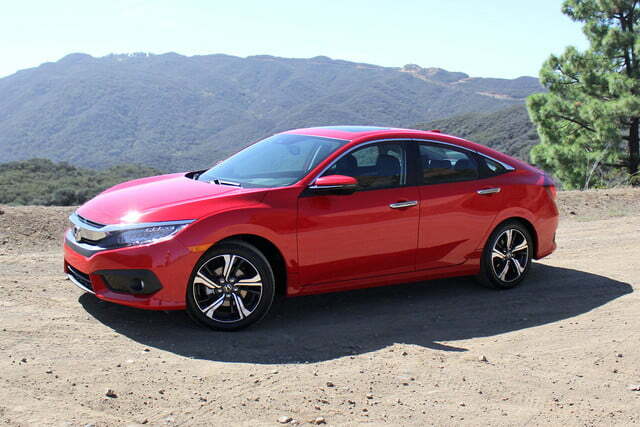 The Honda Civic is so well established in the compact sedan segment that the Japanese automaker could have totally flubbed the 10th generation’s design, driving dynamics, and technology, and it would still sell by the boatload. Remember the ninth generation that debuted in 2011 and received a facelift just one year later? Despite the maligned styling, it was still a top seller in the segment. So why risk starting from scratch with the 10th generation? 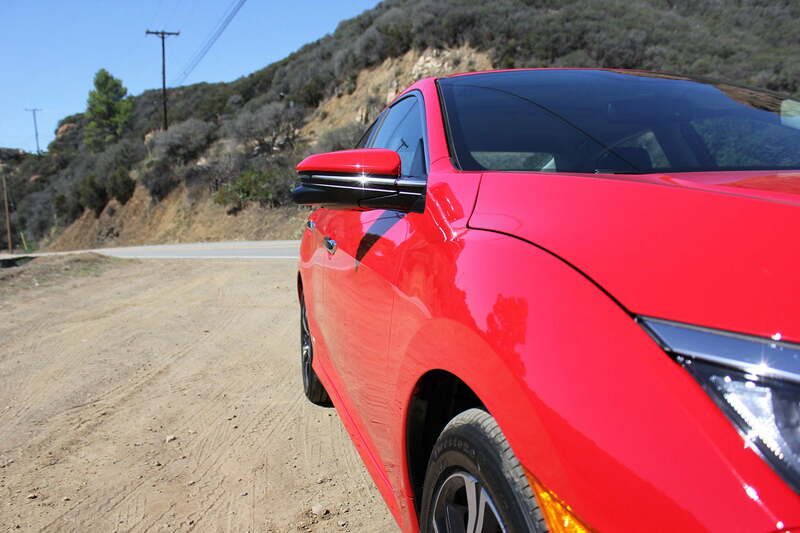 Honda wanted to outperform the best handling model in the class (Mazda3) while also substantially improving its styling, interior technology, and cabin space. The result is a production vehicle that looks remarkably similar to the Civic concept that debuted at the 2015 New York Auto Show, complete with a host of segment-leading features and a pair of more powerful and efficient engines. 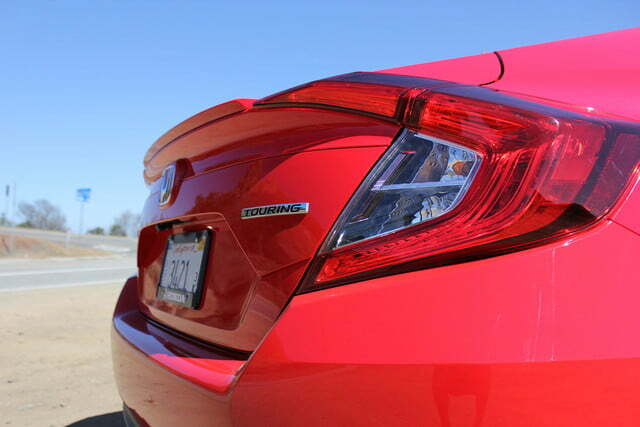 Honda says this is the most significant redesign of any Civic generation, going so far as to call it “epic.” Now usually I’d trigger an eye roll in response to that phrasing, but within the universe of traditionally mundane compact sedans, the 2016 Honda Civic just might be as close to “epic” as it gets. 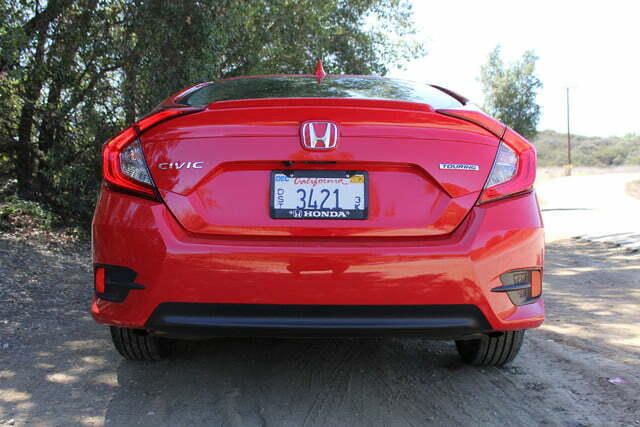 With increasingly bold styling from some of the Civic’s competitors like the Ford Focus and Mazda3, Honda needed to inject a bit of zest into the 10th generation Civic’s bodywork. Sticking closely to the Civic Concept’s larger, sharper front fascia (seen in similar forms on the 2016 CR-V and Accord), the new Civic strikes a confident pose from the first glance. Moving rearwards, the sedan gains flared wheel arches, sharper creases, and dual character lines that cross at the rear haunches. 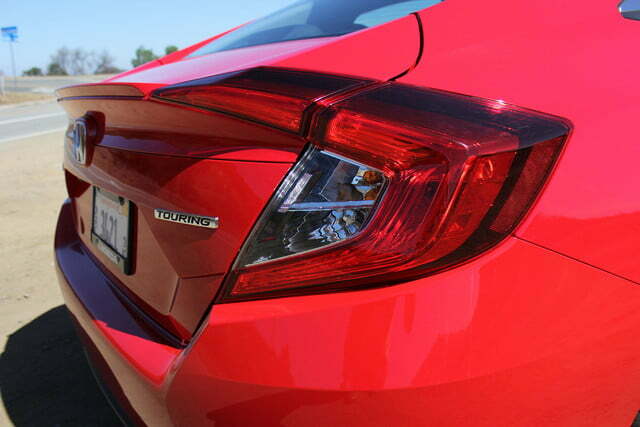 At the back, its Crosstour-esque fastback is complete with boomerang-styled LED taillights. Though the design has the potential to rub a minority of shoppers the wrong way, its muscular looks will probably attract more eyeballs than it will lose. The new Civic is 0.8 inches lower, 3.0 inches longer, 2.0 inches wider, with shorter overhangs front and rear, giving it a squat stance. When you step inside, the added length really comes into play. 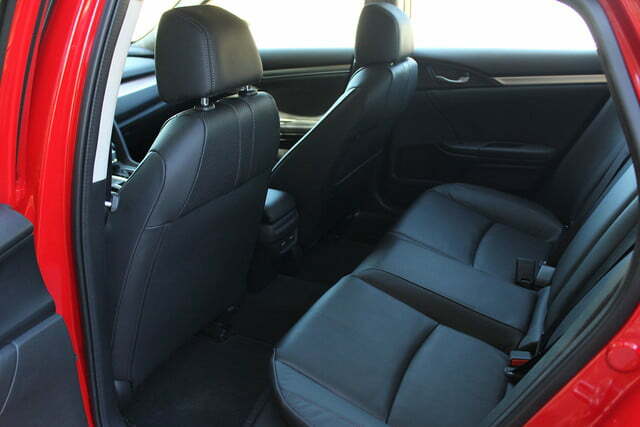 Rear seat passengers gain 2.2 inches of legroom, meaning a 6’3” passenger can fit comfortably behind an individual of similar stature. 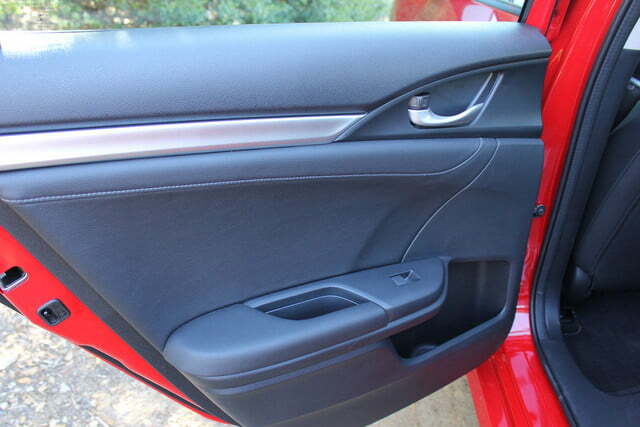 By ditching the three-tiered dash, Honda has also created a sense of additional space up front. 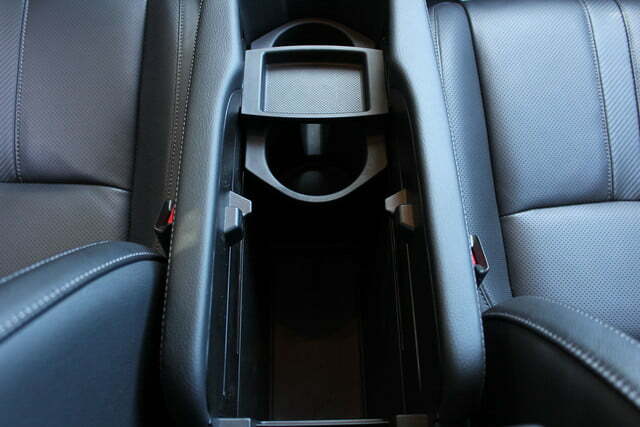 Interior storage is superb, with a cavernous armrest cubby, removable cup holders, and a storage tray under the center stack. 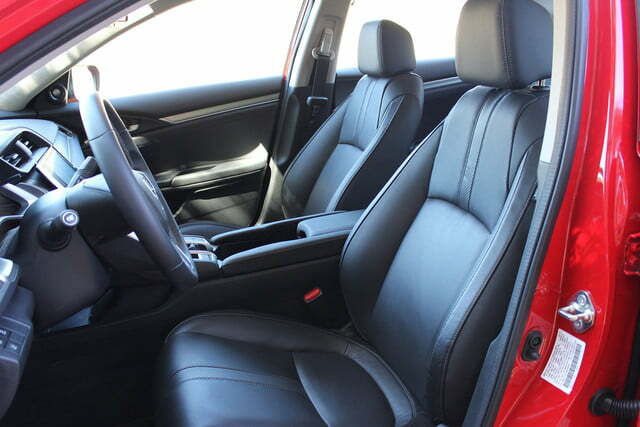 In base spec, the interior retains plenty of soft-touch and textured materials to deliver a premium feel, while higher-level trims add leather wrapping to the steering wheel, shift knob, and dashboard. 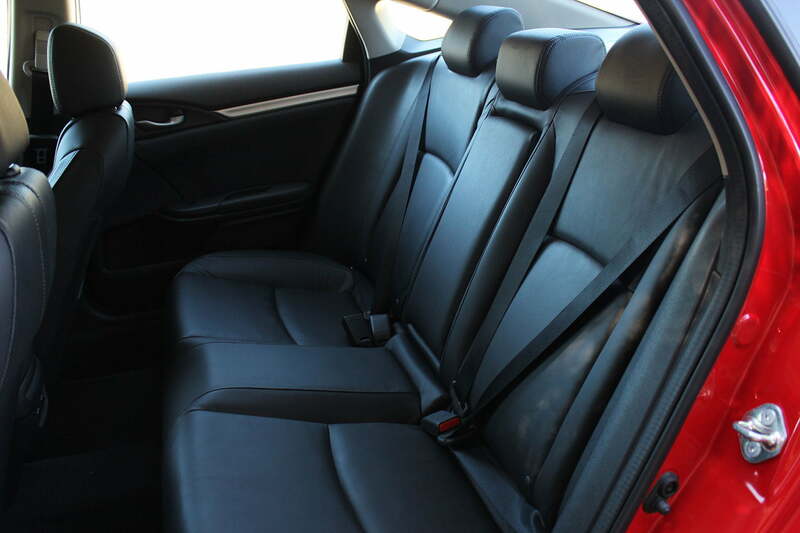 One of the finest updates to the new Civic’s cabin is the redesigned seats. 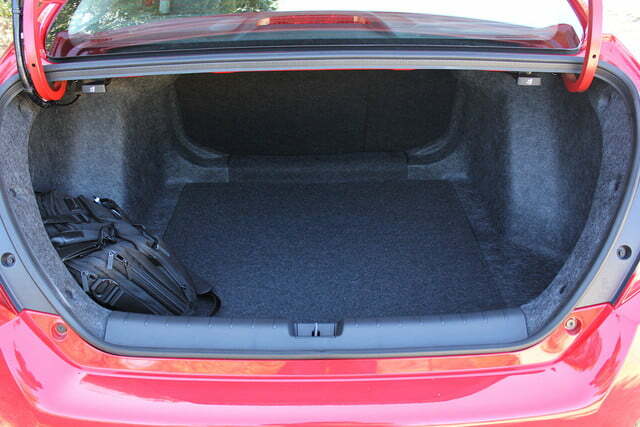 Not only are they lower, offering more headroom for front occupants, but both leather and fabric designs are comfortable and provide excellent lateral bolstering. 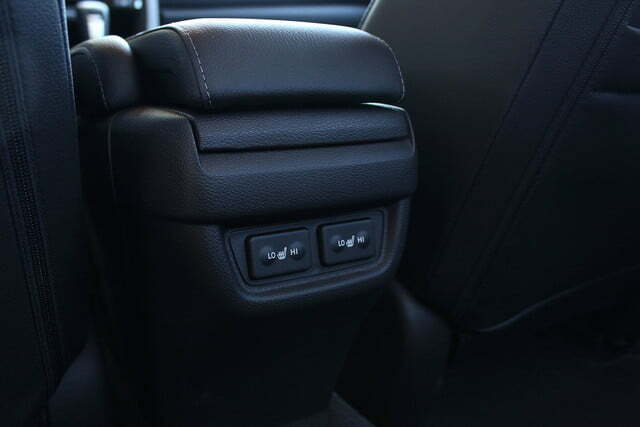 This is easily the most ergonomic and attractive cabin in the class. 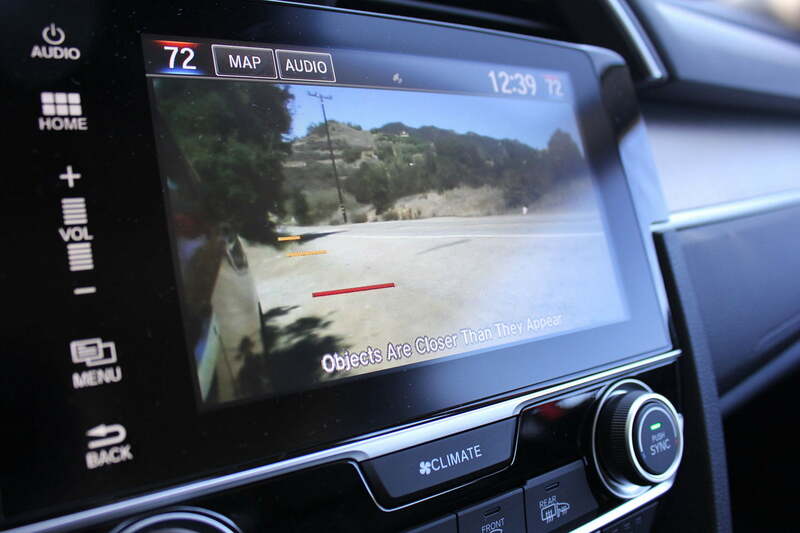 For the Civic’s target age demographic, 18 to 35-year olds, convenience and technology features are among the highest priorities for a new vehicle purchase. 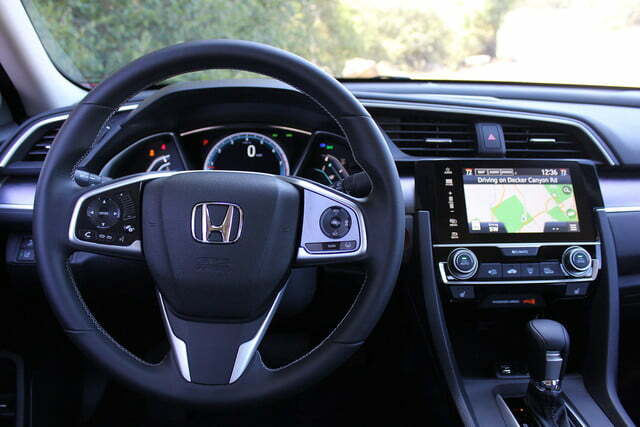 Not only has Honda made its suite of “Honda Sensing” safety features standard on its new Touring trim, but Apple CarPlay and Android Auto are now equipped on all EX and above trim levels. 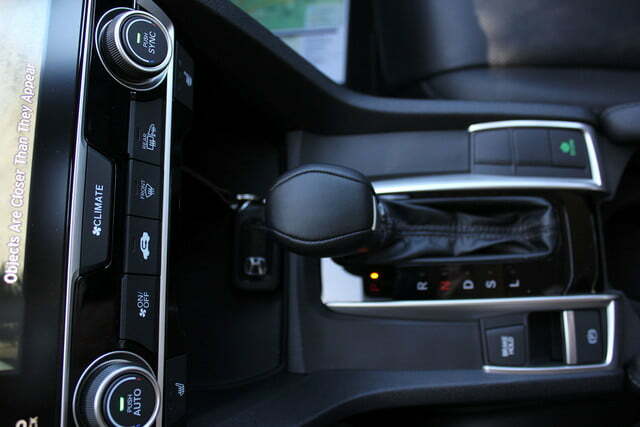 I first experienced Honda’s application of Apple CarPlay and Android Auto in the 2016 Accord and it’s the same story with the new Civic: snappy inputs, incredibly simple integration, and intuitive functionality. 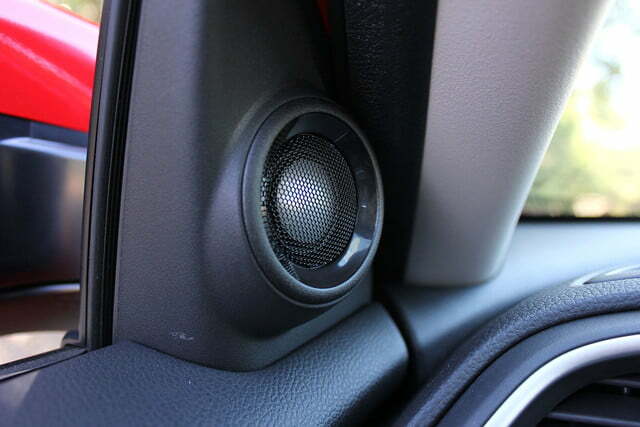 As for the Honda Sensing technology, it’s easily some of the best in the industry. Just like the new Pilot SUV, Adaptive Cruise Control (ACC) with Low-speed follow, Lane Keeping Assist, Road Departure Mitigation, CMBS (collision mitigation braking assist), Forward Collision Warning, and Lane Departure Warning all work seamlessly. Notably, ACC with low-speed follow will work from highway speeds all the way down to stop-and-go traffic. 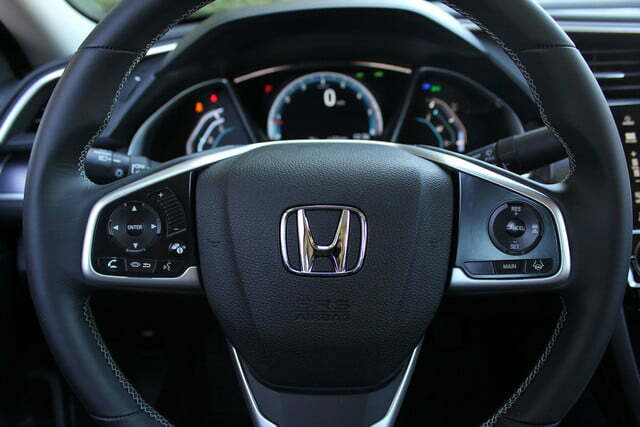 To keep the new dashboard clean, Honda has replaced several physical buttons with touchscreen functions and electrostatic sensitivity. 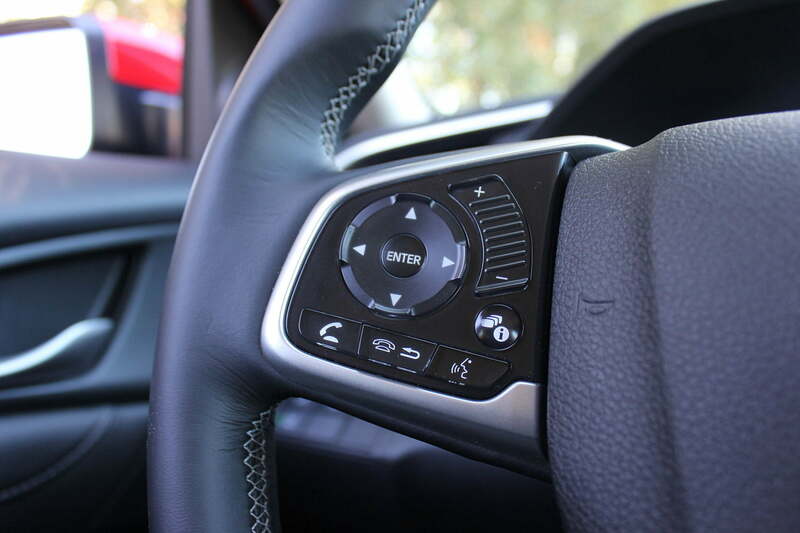 The latter function, which basically applies your finger’s static discharge to turn swipes and other gestures (like it would on an smartphone screen) to both the new 7.0-inch infotainment system and the steering-wheel mounted controls. While I still wish there were more center-stack button redundancies, it’s a handsome, intuitive system that’s among the better systems on the market. 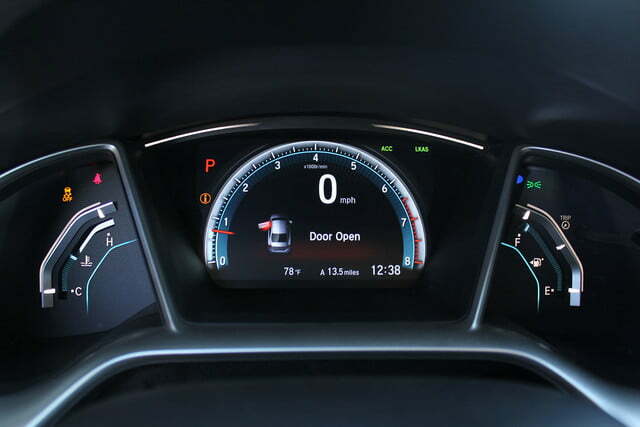 Honda also turned its attention to the Civic’s display gauges. 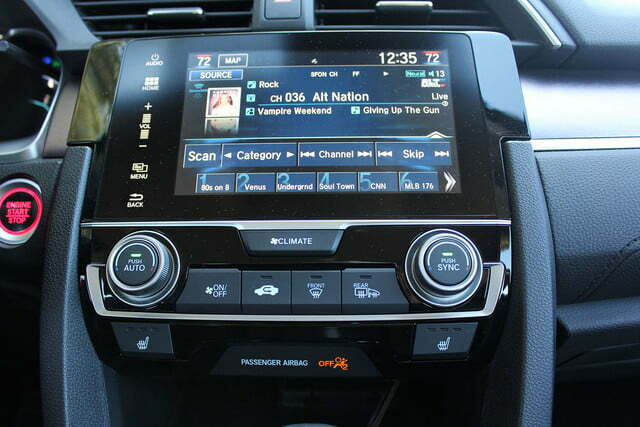 The center display is now fully digital, showing the speedometer, tachometer, and a customizable screen with controls for navigation, audio, smartphone, and vehicle settings. The readouts are crisp, usable, and give the cockpit a more upscale look. 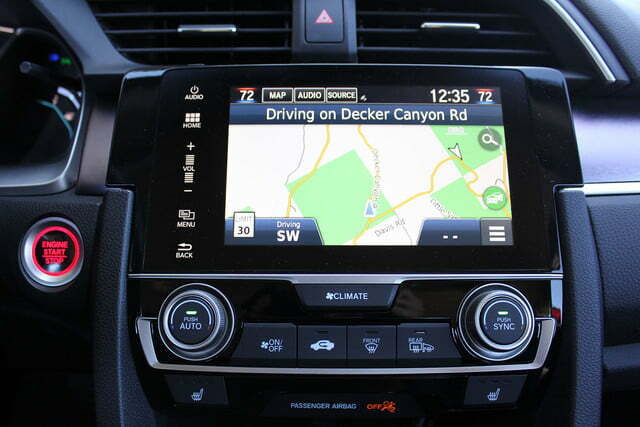 Newly available features include: remote engine start, walk-away auto locks, smart entry doors and trunk, push button start, an electric parking brake with brake hold, straight driving assist, Garmin navigation with 3D view and real-time traffic, rain-sensing wipers, a 450-watt 10-speaker sound system, and a capless fuel system. 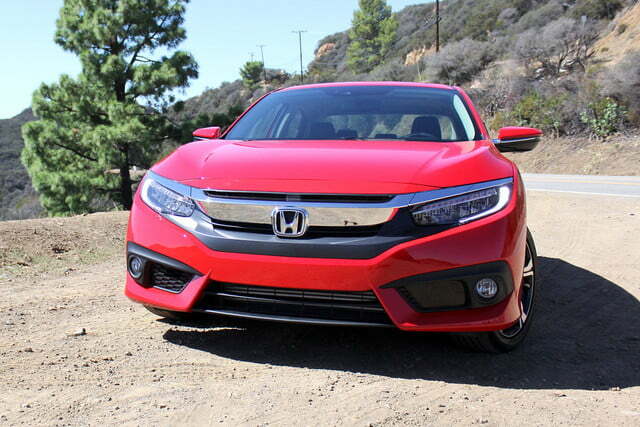 A fully-loaded 2016 Civic will go toe-to-toe with cars costing twice as much when it comes to tech goodies. 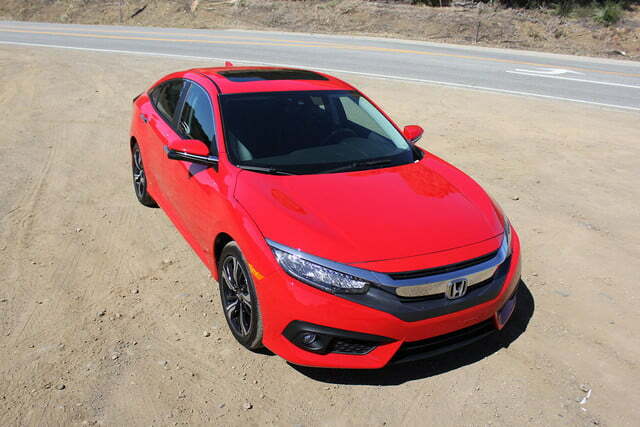 The 2016 Honda Civic sedan is the tip of the iceberg for its new platform. 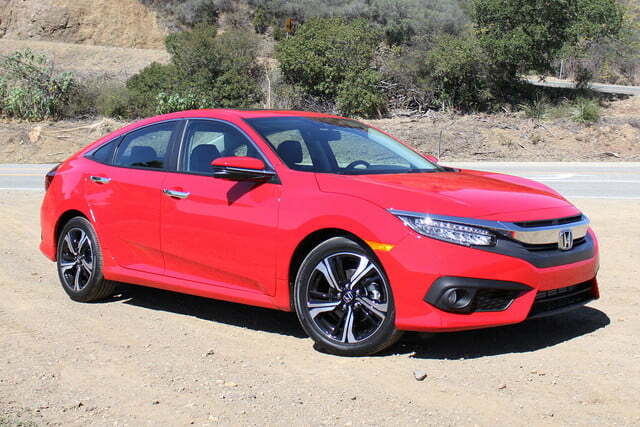 Coupe, five-door hatchback, Si, and Type R derivatives are coming, and that means Honda engineered the sedan’s chassis to handle far higher performance applications. From the ground up, Honda’s ACE (Advanced Compatibility Engineering) platform is not only lighter than the previous generation Civic (68 pounds were shed despite the car’s increased size), it’s also safer than the outgoing car. 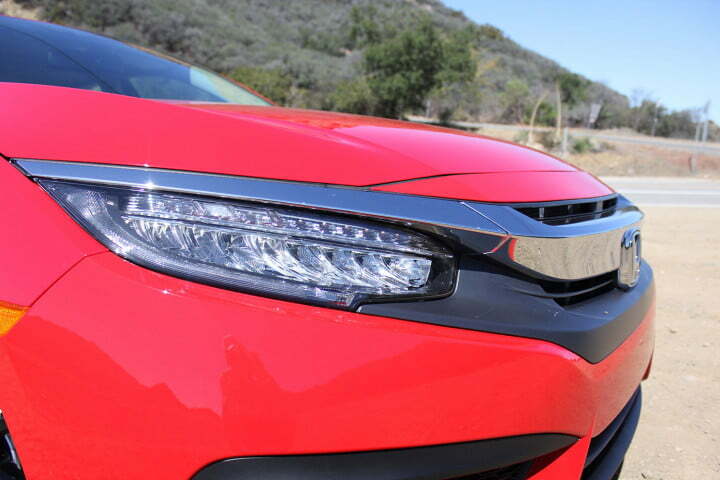 A combination of high-strength steel and advanced layering and welding lead to an increase in torsional rigidity by 25 percent and Honda expects the new setup will secure top safety ratings from the NHTSA and IIHS. 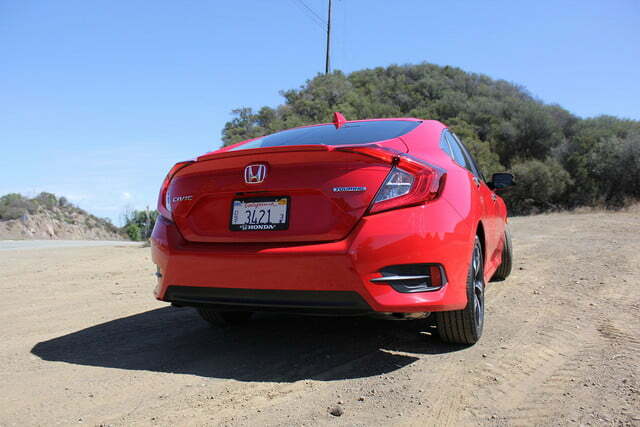 In addition to a more rigid platform, Honda added a sophisticated suspension, combining an independent multilink rear, MacPherson strut front, and hydraulic bushings. 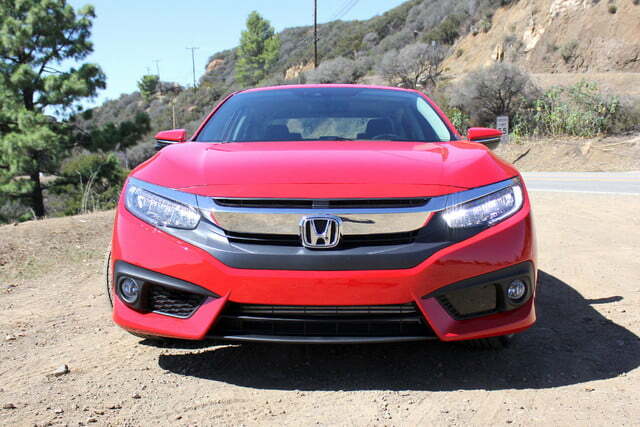 Honda stated that it not only targeted the best handling cars in its class, it’s gunning for German sport sedans as well. 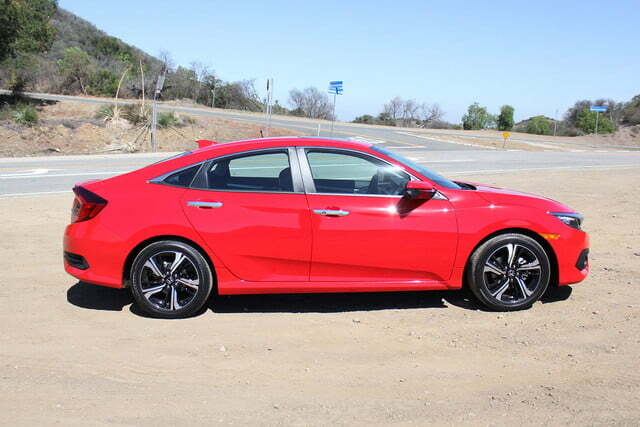 Though its new 2.0-liter four-cylinder with 158 horsepower and 138 pound feet of torque is no slouch, the real gem is Honda’s new 1.5-liter turbocharged four-cylinder that develops 174 hp and 162 lb-ft of torque. 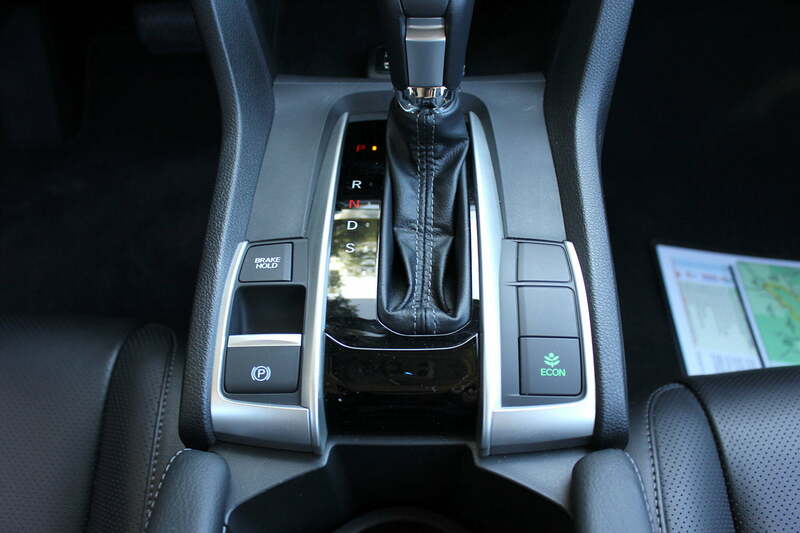 Both engines manage 35 combined miles per gallon and are paired with unique CVT transmissions. 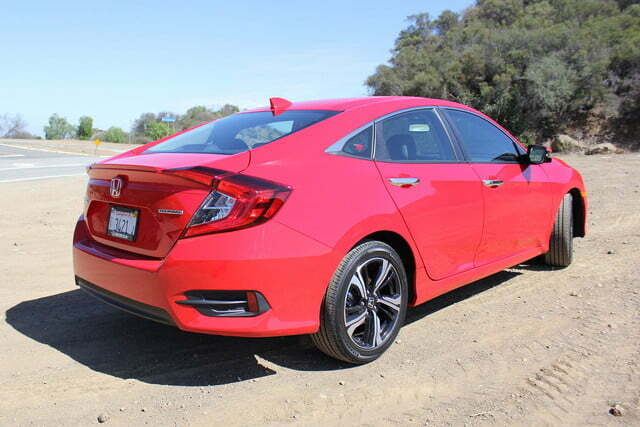 Honda promises a six-speed manual is coming for the full range, but for now, only the entry-level LX sedan will be offered with the standard transmission and a combined 31 mpg rating. 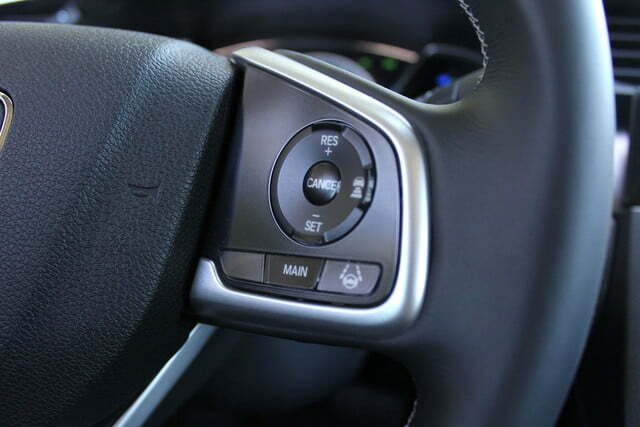 Fortunately, the new CVTs shift intelligently, and when Sport mode is engaged, they will hold gears during more rambunctious driving spurts. 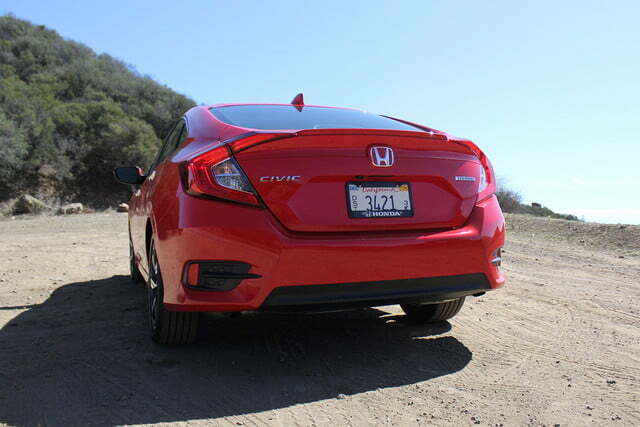 From behind the wheel, it’s amazing how far the new Civic has come in terms of driving dynamics. Its larger brakes provide excellent stopping power, the retuned electric steering offers good weight, and body roll is held in check. A comparably-equipped Mazda3, Toyota Corolla, and Ford Focus were available to test against the new Civic, and while some performed admirably, the Civic felt more stable at speed, and handled corners with greater confidence. While the new Civic sedan has clearly accomplished its mission to become a better driver’s car, I couldn’t help lusting after the upcoming Si and Type R. With such a strong foundation, more powerful variants will undoubtedly renew Honda’s performance credibility. 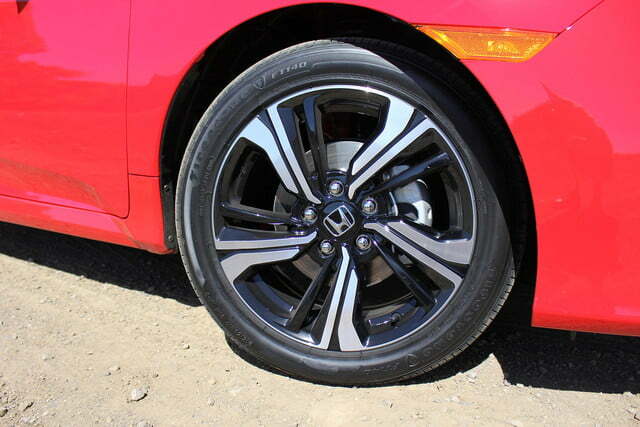 Pick up a pair of some trendy shoes to go with your trendy new Civic. These are comfy too; bonus! You’re going to need an iPhone to pair with that fancy Apple CarPlay system, so why not get it Prime fast. 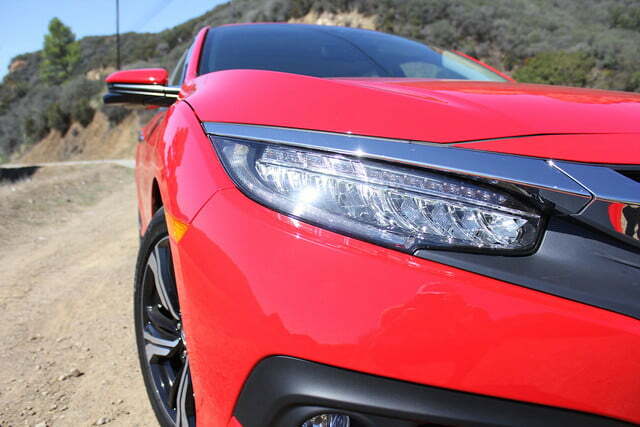 The 10th generation Civic is definitely something to be proud of. Feel free to rep your ride. 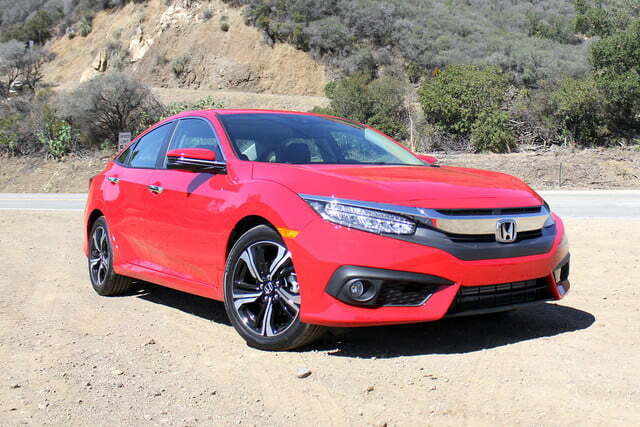 Honda has more than exceeded expectations with its 10th generation Civic. 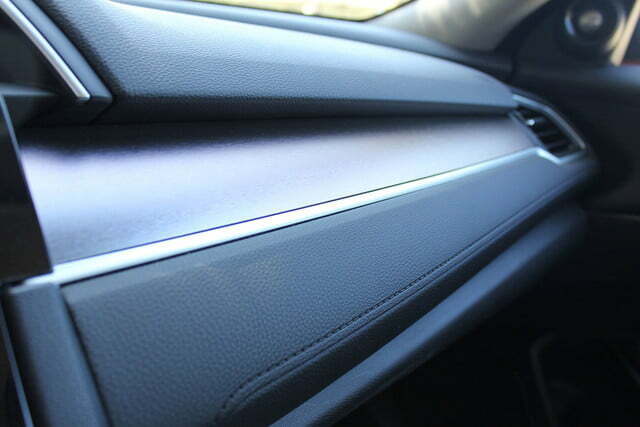 Its staple sedan not only leads the competition in terms of safety, technology, styling, and performance, its higher trims touch the floorboards of entry-level luxury models. While I wouldn’t call them equals on a racetrack, I’d wager you’d give some German and Japanese sport sedan owners a lot to think about after a test drive. 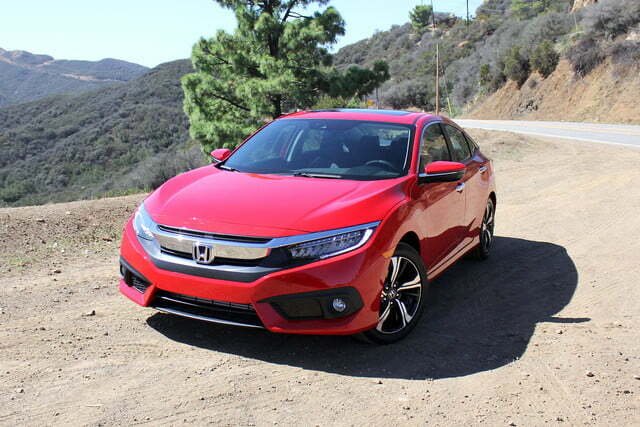 The 2016 Honda Civic sedan goes on sale in November of this year with the coupe following this winter. 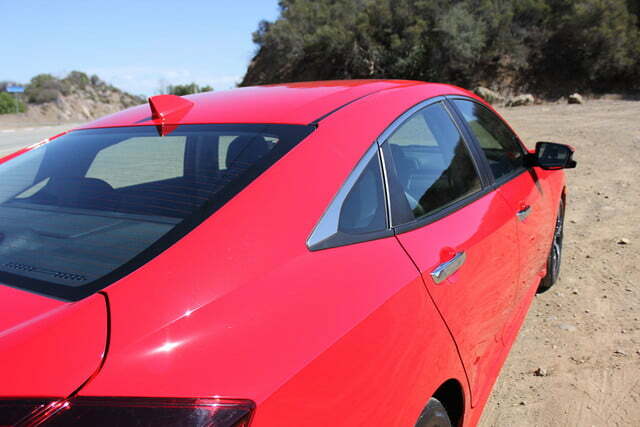 Pricing for the entry LX sedan with a 2.0-liter four-cylinder engine and six-speed manual (the only trim that will offer the manual initially) will kick off at $18,640 (not including a destination fee). 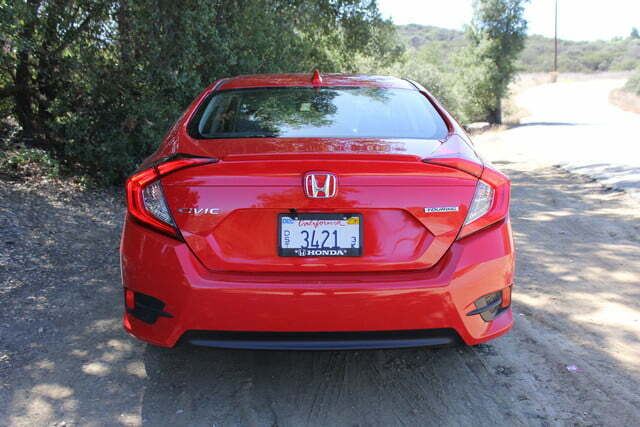 The EX trim will start at $21,040 with the same 2.0-liter engine and a CVT transmission or $22,200 with the 1.5-liter turbocharged four-cylinder. The EX-L will cost $23,700, and the new range-topping “Touring” spec will retail for $26,500. 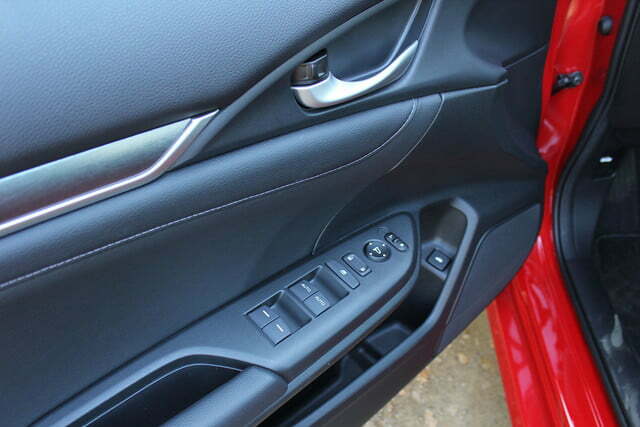 Honda Sensing safety features will be a premium of $1,000 at every trim level, but is included with the Touring trim. That’s a whole lot of car for the money in my book.